Much like the Coen Brothers, Steven Soderbergh has two distinct sides. There’s the ‘serious artist’ side, the one responsible for movies Contagion, Solaris, and Traffic, and the side that makes delightfully light-hearted genre movies. As much as I may enjoy Serious Soderbergh, I always have the most fun with the Soderbergh who made Ocean’s 11 and Out of Sight. And thankfully for those of us tired of grimdark summer blockbusters, that’s the Soderbergh on full display in the first trailer for Logan Lucky. The first trailer for Logan Lucky is a pure country romp, with Adam Driver and Channing Tatum leaning hard into their roles as dim-witted bank robbers and Daniel Craig looking like a man freed from a lifetime of dour spy movies. Not only does the film poke some gentle fun at NASCAR culture as a whole, but it also does so with some of the best actors in the business along for the ride. Sebastian Stan pops in for a smaller role, as does Katherine Waterston, Hilary Swank, and a whole bunch more. Good heist comedies are always in short order, and Logan Lucky has a chance to be one of the better ones to come around in a while. Trying to reverse a family curse, brothers Jimmy and Clyde Logan set out to execute an elaborate robbery during the legendary Coca-Cola 600 race at the Charlotte Motor Speedway. The production shot at Charlotte Motor Speedway during the actual NASCAR Coca-Cola 600 and the Bank of America 500, as well as at Atlanta Motor Speedway. In a fun twist, six NASCAR stars pop up in non-driver cameo roles in the film. 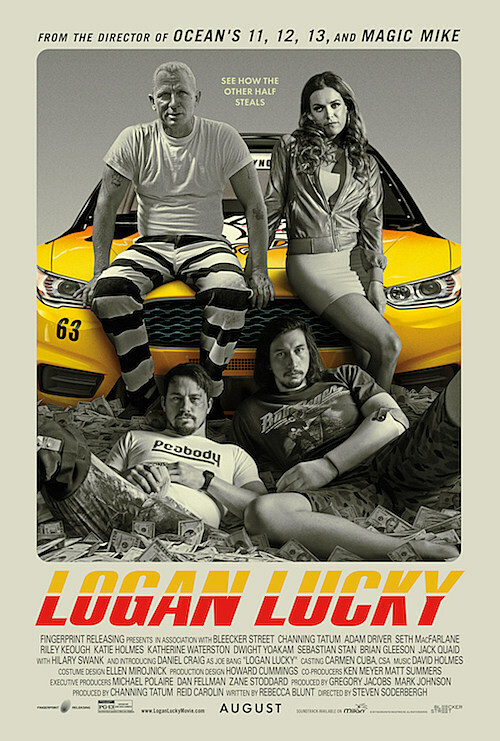 In addition to the cast listed above, Logan Lucky also features Seth MacFarlane, Riley Keough, and Katie Holmes. The film will zoom its way into theaters on August 18, 2017.